Tonight, the slender waxing crescent moon lodges close to the planet Venus. This dazzling world ranks as the third brightest celestial body in all the heavens, after the sun and moon. As seen from both the northern and southern hemispheres, Venus will set beneath the west-northwest horizon about 2.5 hours after sunset. Our chart shows the sky as it looks from mid-northern latitudes in North America. 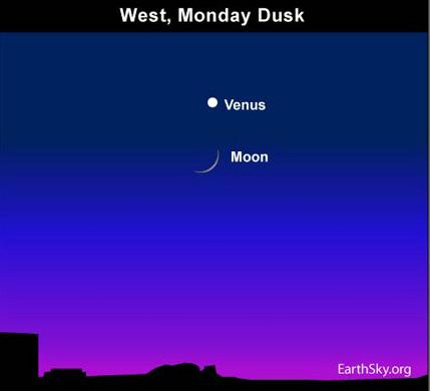 From almost everywhere worldwide, however, all you have to do is to look westward in the evening dusk to see the moon and Venus beaming in the sky. With a clear sky and an unobstructed western horizon, the shining duo will be virtually impossible to miss! The moon will stay in the vicinity of Venus for the next few days, whereas Venus will continue to light up the western evening sky for the next several months. Venus – though always brilliant – will brighten even more, to shine at its brilliant best in September 2010. If you have binoculars, check out the crescent moon. See if you can spot earthshine softly illuminating the nighttime side of the lunar disk. Earthshine is sunlight that is reflected from the Earth and back to the moon. Site contents copyright © 2019 Recorder Online	except as noted. All rights reserved. | 88 queries in 2.508 seconds.